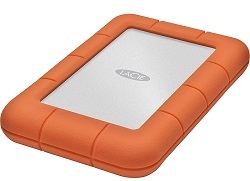 With its iconic orange design and secure form factor, the Rugged has been one of LaCie's most popular hard drives. With the Rugged Mini, they shrunk the Rugged, and added tons of new features, making it a solid investment for on-the-go data transport. The LaCie Rugged Mini 5400 RPM Hard Disk shares features with LaCie's popular Rugged Hard Disk, like shock resistance, drop resistance, and a rubber sleeve for added protection. But with the Rugged Mini, LaCie has gone a step further: it's also rain-resistant, and pressure-resistant-you can drive over it with a 1-ton car, and it still works! Its small size makes it perfect to take with you wherever you go, and its Rugged exterior provides protection against accidental drops, shock, or pressure. The Rugged Mini doesn't just keep your data safe from external forces - it also protects against intrusion. With secure password protection software built-in, it's easy to make sure that your files are secure and protected, no matter where you go. You can even use access your password-protected files using any computer, ensuring complete data mobility - and complete data safety. Including Automatic Backup with an easy setup and automatic worry-free backup for both PC and Mac computers. Dimensions: 86 x 135 x 19 mm / 3.4 x 5.3 x 0.75 in. Bitdefender Antivirus Plus has had the best virus detection rate for 5 years in a row! Bitdefender Antivirus Plus protects against even the most dangerous e-threats without affecting your system’s speed. This means you get pure performance, with no slowdowns. With Autopilot on, Bitdefender Antivirus Plus automatically makes the best security decisions to safeguard your data, your online transactions and your privacy.